Today Susan and I decided to go on a bit of a day trip to a couple of small townships. I must admit we did get ourselves slightly lost (talking to much I am thinking) so we decided just to keep driving and see where we ended up. After leaving Eden we stopped at Merimbula for a little shopping. Merimbula is a town where I have camped on many occasions with my ex husband when my kids were little. It holds a lot of good and sad memories for me, so it was good to be there with Susan to see it with different eyes. Then it was onto Bega - known for it's yummy "Bega Cheese". 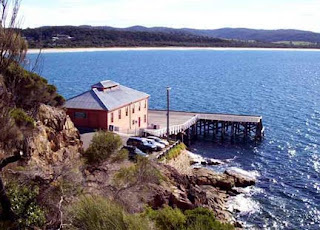 We drove a little further north to Cobargo and then we headed east toward the coast and the delightful township of Bermagui where we had a yummy feed of the very freshest fish. 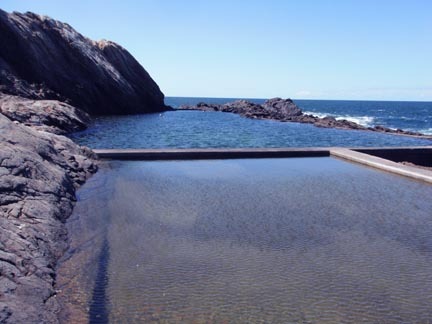 Bermagui is a very nice township with a really good feeling about it. One of the tourist attractions in Bermagui is the saltwater "Blue Pool" that would be a very refreshing place to go for a swim and hang out on a nice warm day - today was just a little to chilly. 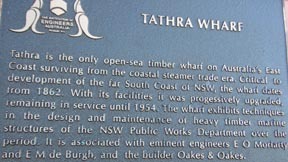 Then it was onto Tathra where the "Historic Steamer 1862 Wharf" is located. We then headed on the road back to Eden for a nice relaxing evening with my boy - Shane. Tomorrow we might try and find the towns we couldn't find today. What a fantastic way to spend a day Davine, great company and a road trip, what more could a girl ask for? ;-) I love the pool, it looks so inviting even if it's cold out! Enjoy your day my friend. So came to see my creativ blog... aswell the Japan' blog where I have met several Bouddhas.